In this image acquired on January 5, Cassini’s near-infrared vision pierced Titan’s opaque clouds to get a glimpse of the dark dune fields across a region called Senkyo. The vast sea of dunes is composed of solid hydrocarbon particles that have precipitated out of Titan’s atmosphere. 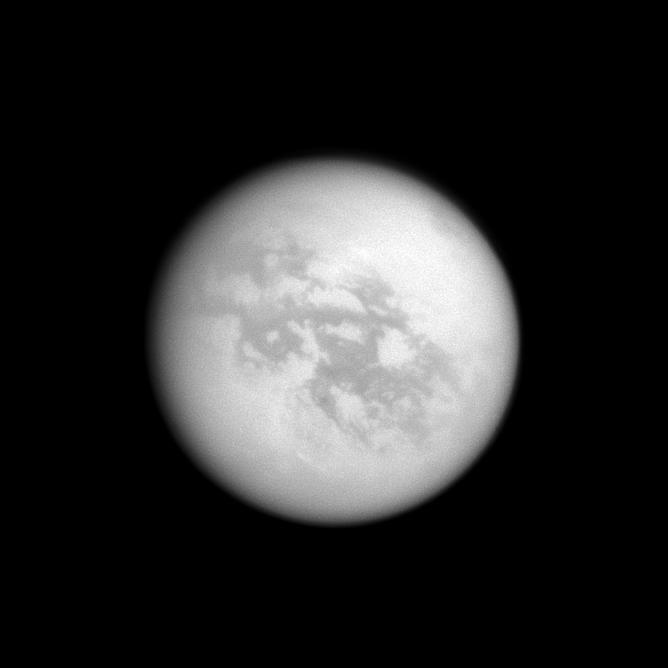 Also visible over Titan’s southern pole are the rising clouds of the recently-formed polar vortex. In the image above north on Titan is up and rotated 18 degrees to the right. It was taken using a spectral filter sensitive to wavelengths of near-infrared light centered at 938 nanometers. The view was obtained at a distance of approximately 750,000 miles (1.2 million kilometers) from Titan. Observations of the dunes with Cassini and ESA’s Huygens probe during its descent onto Titan’s surface have shown that the moon experiences seasonally-shifting equatorial winds during equinoxes, similar to what occurs over the Indian Ocean between monsoon seasons. The name Senkyo refers to the Japanese realm of serenity and freedom from wordly cares and death… in line with the IAU convention of naming albedo features on Titan after mythological enchanted places. Click here for an earlier view of Senkyo, and follow the Cassini mission here.